More than 95% of Pakistanis do not know CPR. Around 70% of cardiac arrests occur at home and during the dark hours. 92% of parents do not know what to do if there child chokes on food and stopped breathing. More than 90% of deaths due to choking occurs at home. Every one minute without CPR/Oxygen/AED means 10% of survival chances are lost. 10 minutes and over, probable brain death. Sudden Cardiac Arrest can strike anyone, at anytime and anywhere. There are over 8750 hours in a year and you have to plan for 1 or 2 hours hands-on session. You can become a lifesaver. The life you save could be someone you love. Search for CPR training providers in your area and plan course for yourself or in-house session for family. 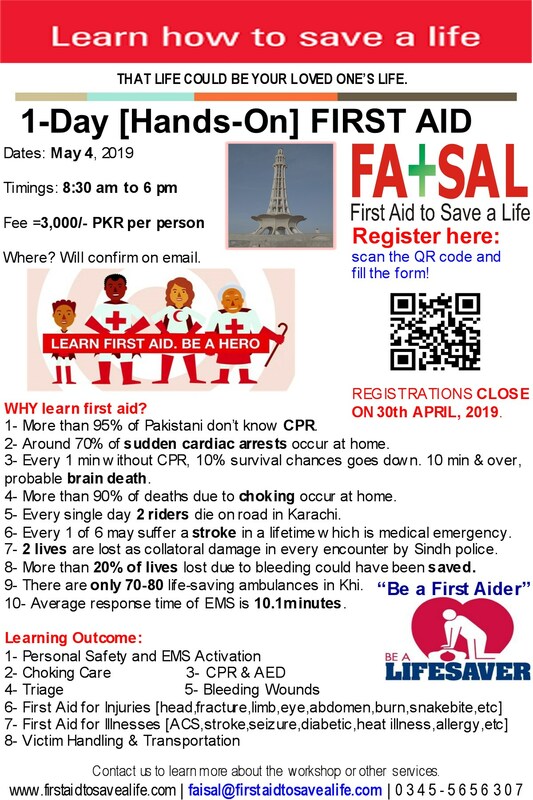 It would be great learning altogether and could be one of the most memorable gathering where objective is to learn something and save other person’s life. We too offer bespoke trainings and serve where our clients live and work. Students must perform the required skills competently without assistance to get this certificate.